Over the past two weeks I’ve offered the bears two plane flights and a train ride around Southern France. They neither managed to take me down me nor put much of a dent in the 25-day SMA on the S&P cash. What does it take!!?? Now all joking aside – it’s good to be back and much elated to still see equities meander all over the place without a clear sense of direction. Why would I say that? My ongoing long position was just stopped out at break/even after having climbed to 1R and change. But that exactly was the problem. Over a week since I flipped to a long campaign and since then the bulls managed to only advance about 30 S&P handles. Don’t get me wrong, I’m the first in line when it comes to low volatility squeezes in equities. 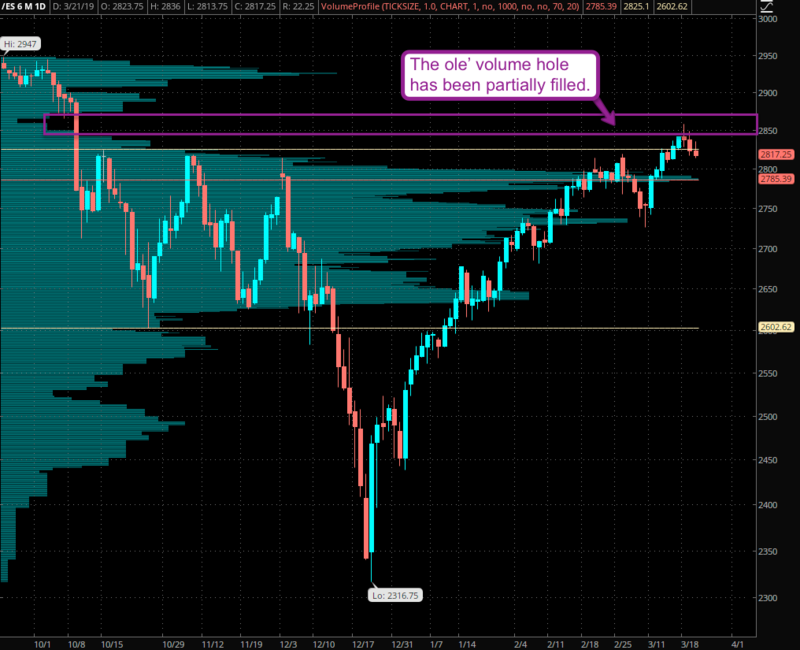 But so close to the endzone of SPX 2800 – is this really the time or the place? Actually yes – this is EXACTLY the time and the place. Look – think about what Tony said about counter plays to human psychology. We are looking at a long con here. Low volatility advances are among the most lethal when it comes to luring in contrarian traders eager to nail the final top – over and over again. And the more this happens the more hapless victims are lining up for their opportunity to have their account taken to the woodshed. Every little wiggle – even the teeniest weeniest spike high becomes another juicy piece of meat dangling in front of their salivating snouts. Then the trap slams shut – the voices go silent (i.e. comment count drops) – lather – rinse – repeat. Now let me be clear – I am NOT saying that we many not see lower lows here. After all the signatures on the UVOL/DVOL panel are a bit puzzling right now and suggest all sorts of institutional players are bouncing the ball between them. One could do a deep analysis of L2 activity but just looking at that I already know that it’s best to wait for the elevator out of the confusion zone. 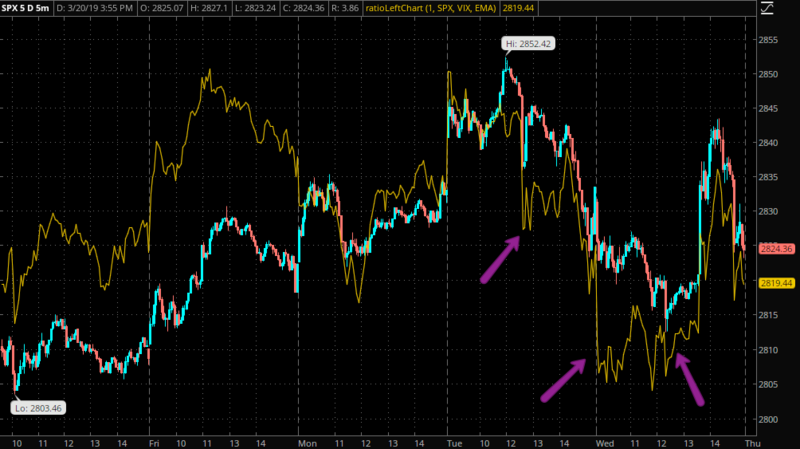 See here how the SPX:VIX ratio suddenly shifted from leading higher to dragging lower? 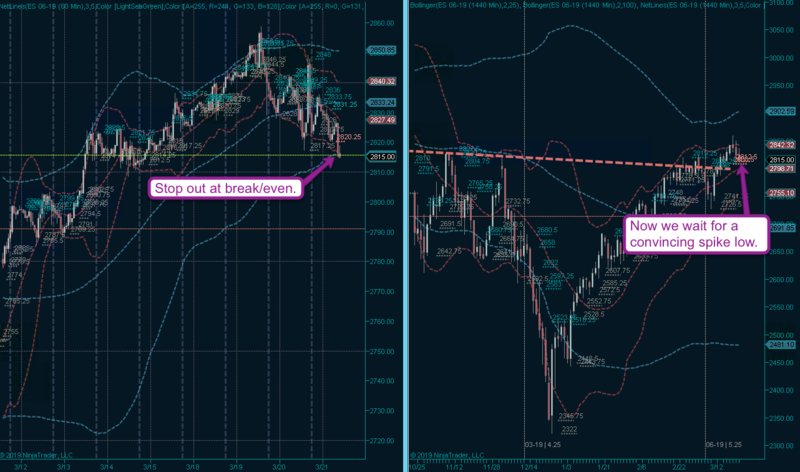 Unless I see this inverting back it’s not yet time to call it a floor and load up on longs. 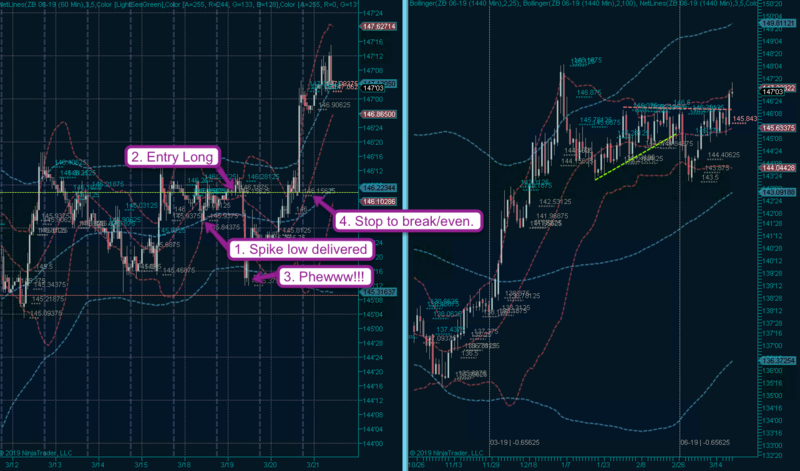 Yes, load up on longs – I just said that. Say what? You are still waiting for the floor to give way so that your cumulative collection of weekly March or April puts may not expire worthless? Well, sure anything is possible in the financial markets. But is it probable? Let’s look at where we are in the game here. The ole’ volume hold has been partially filled and all I am seeing is a sea of white/green candles interrupted by obligatory reload opportunities. Nothing bearish about this chart. When in doubt – don’t [try to] beat the system – go go with the flow. Gold finally triggered the entry I have been coveting since before I left for France. If you were a sub I hope you caught this one as it has medium to long term potential. Another symbol I pimped to the subs was the ZB which I had been coveting for weeks as some of you may remember. After a quick punch higher I was waiting for a spike low which was promptly delivered. My ISL below an earlier SL was almost taken out – so I got really lucky on this one. Stop now advances to break/even while I enjoy 1R in paper profits plus the satisfaction of having executed this campaign as planned. My crude campaign was also only inches away from taking out its ISL. Maybe Ms. Market has a crush on me or something as I’m not used to enjoying so much good luck. 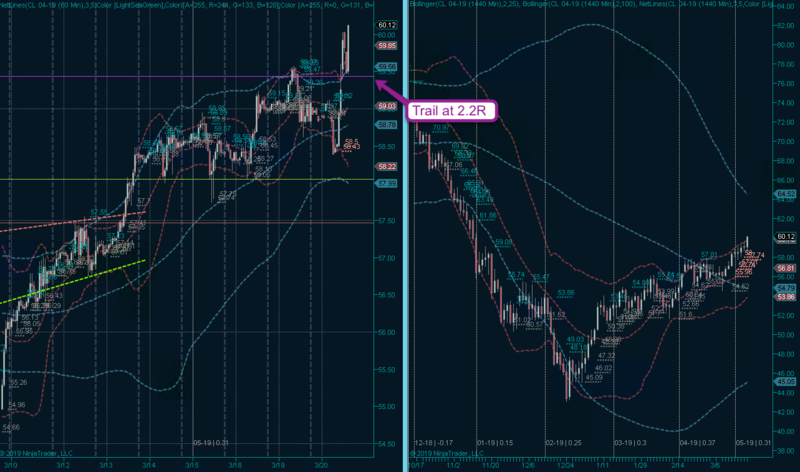 My trail now advances to 2.2R with hopefully a lot more short squeeze goodness to come. By the way, if you missed these or other recent entries or perhaps even found yourself on the losing end, then head over to the sign up page to once and for all remedy this unfortunate situation. 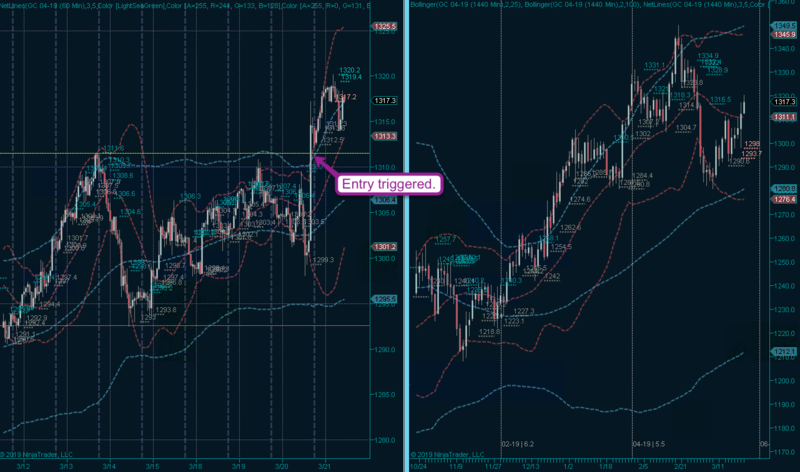 Evil Speculator Gold goes for less than the cost of a single E-Mini handle and if you enjoy trading it you may as well sign up for the Zero which includes Gold plus a continuous feed of our most popular market participation oscillator.